Have you ever wanted to quit homeschooling? You’ve doubted yourself. Your kids have driven you crazy. You’ve been tired and burnt out. Your kids have complained and refused to do work. You’ve wondered if you were actually cut out to do this job. Yes, I’ve been there too – more times than I’d like to admit. And while quitting at homeschooling isn’t an option right now, I have fantasized about sending my kids for a ride on that giant yellow bus and having a quieter house for a few hours. Yet I press forward, and so do you. Keep up the good work, dear homeschool mom! 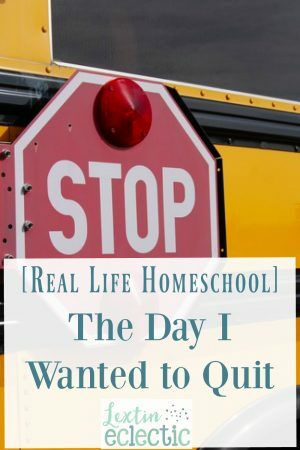 And if you’d like to have a little homeschool solidarity (and a few laughs), read on to see the day that caused me to want to quit homeschooling. Here was my not-so-very fun day homeschooling my 6 kids – Curly (age 11), Tiger (age 9), Bee (age 7), Ladybug (age 6), Punkin (age 4), and the baby (who is almost 1). 6:27 – My husband yelled at me that we’d overslept and it’s past time to get up. He rushed out the door to teach his 7:40 class at the university and I stumbled down to the basement to start our school day. I felt groggy and basically terrible, but determined to make today a good day (the day before had been blissful and I was ready for a repeat). 6:30 – Curly (11) was throwing a screaming tantrum about school and that she was behind and that everyone was bothering her. I just sat in stupefied silence as she unleashed all of her pent up frustrations at me. Alright! I wasn’t expecting that this morning! I worked to help her calm down before we started on her schoolwork. We got it all done in record time and I tried to encourage her that she was doing a wonderful job. 7:15 – I started working with Bee on her schoolwork while Curly (11) stomped upstairs to work on independent work. Bee (7) sobbed during math time because she was absolutely convinced that 5×6 was 35. She sat next to me screaming that it HAD to be 36 and that she was right and that she had no idea what she was doing. Oh my goodness! The girl would not listen to reason. 8:10 – I trudged upstairs to the kitchen after finishing most of Bee’s (7) school. She had finally figured out the answer to her multiplication problem and we survived spelling and grammar even though she cried when we recited the prepositions.I found a crabby baby with a dirty diaper waiting for me. The kids put breakfast on the table as I got the baby ready for her breakfast. Then the kids argued about who would recite their AWANA verses first. There was SO. MUCH. screaming over the Bible verses. No one else saw the irony in that, but me. 8:45 – Breakfast ended and the kids brushed teeth while I attempted to do dishes. The baby cried in her high chair and threw the rest of her breakfast on the floor after putting part of it in her hair. 9:00 – I was attempting to brush my teeth while the baby clung to my legs when Curly (11) ran upstairs to tattle on Tiger (9). I think it took me a good 5 minutes to calm her down enough to actually understand what she was trying to say. 9:10 – I started school work with Ladybug (6) after my usual reminder about having a cheerful spirit. She forgot how to count by 2’s, couldn’t add 1 to any number and do her basic addition facts, and did not remember how to count to 30. We finally made it to reading time and she threw herself on the floor screaming that she hated reading. Ok then! We made it through 3 sentences while she complained that she was itchy, that she hated her curly hair, that her foot hurt, and that she was dying of thirst. She “fell” out of her chair 4 times. At that point I gave up and instructed her to take a walk on the treadmill for a while. During this time the dog also ate two pages of her handwriting book that she had thrown on the floor. That caused her to have another screaming fit. 9:50 – I had to finish up reading time with Bee (7) before I could start working with Tiger (9). She came to the room with Punkin (4) following close behind. They were in a giant argument about the Lego castle. I contemplated throwing all the Legos in the trash for a fleeting moment before I helped them resolve their argument. Thankfully Bee (7) finished her reading without too many complaints and I could move on to Tiger. 10:05 – I got the baby ready for a nap and then had another chat with Curly (11) about her attitude. She was clearly having a really rough day. 10:20 – I started school with Tiger (9). He screamed and complained about reading. In fact, it took him a full 30 minutes to read 6 sentences. Y’all, it felt like about two lifetimes while I tried to remain calm and help him snap out of his reading meltdown. Finally I gave up, took a video, sent it to my husband, and then asked him to call me. Five minutes later the phone rang and I handed the phone to Tiger (9). I knew he needed someone other than me to help him calm down. And to be honest, I was just out of patience. 10:55 – After the phone chat, we were able to move on to the rest of our reading lesson and then work on his other subjects. I wasn’t quite prepared when he had a math meltdown because he didn’t understand one of the word problems. I felt like some type of hostage negotiator except that maybe I was really the hostage. 11:35 – The baby was awake with yet another dirty diaper so Curly (11) brought her to me to change her. I sent her back with Curly so they could play together while I finished school with Tiger (9). He spent most of the Spanish lesson insisting that he didn’t know the words and reading them all incorrectly. At this point I was sure that I was completely losing my mind. 12:15 – I finally made it upstairs for lunch after completing most of our morning school work. The kids argued about who would sit where at the table before starting their online history lesson – because it was clearly very important to them that day. 12:45 – I sent the kids off to brush teeth and switch the laundry to the dryer while I did dishes (the breakfast and the lunch dishes because I was really behind). 12:50 – We started on our group Spanish time and the baby decided that she needed to squeal at the top of her lungs every time I said a single word. I could only get words in while she was taking a breath. 1:00 – We did our group Bible time and Bee (7) and Punkin (4) argued about who would color the front side of the Bible page. Then Punkin sat on the floor and cried. And by crying, I mean screamed and was utterly hysterical. 1:15 – We tried to read a little bit of our science and history after Punkin (4) calmed down. 1:30 – I gave up and sent the baby with Curly (11) while she read to Ladybug (6) and Punkin (4). Then I read to Tiger (9) and Bee (7). They listened while throwing a ball back and forth. You can guess how this ends, right? Yes, it hit me right in the head. 2:00 – I declared that school was over. I wrote a list of chores on the whiteboard and escaped upstairs with the baby so we could both have some quiet rest time. The kids came upstairs approximately 12 different times to tattle on each other or to whine about various things. I finally put in my headphones and told them that they’d have to talk to me later because I was just absolutely done. 4:00 – My hubby walked in the door and rescued me from my little army who was almost in full mutiny. I love when he rescues me! I could not do this thing without him! So, you see, we all have really terrible days. We wonder what it would be like if our kids were out of the house all day every day. We fantasize about alone time and quiet. We hide in the closet and eat chocolate (or maybe that one’s just me). I sometimes wonder why I do this homeschool thing. On days like today it’s not even a little bit fun. But I know I’m right where I should be and so are my kids. Homeschooling can be hard. But it’s worth it. And that’s what I keep telling myself. Have you had any days like today? This wasn’t even my first horrible homeschool day. I’ve had plenty. You can read about one of our other awful days here. And if you’re feeling like a failure, give yourself a dose of mom encouragement. Hang in there! You’re doing a good job homeschool momma! Hi! I just found this blog by way of “Hives in the Kitchen,” after our 17 mo old firstborn broke out in hives necessitating an early end to our family get-together for the Memorial Day weekend (with plans cancelled I have lots of unexpected reading time!) We are new to the food allergy-world having received skin prick and rast test results just a couple months ago confirming allergies to six foods (dairy, egg, peanut, treenut, coconut, banana), and are looking ahead to homeschooling our daughter when she’s a bit older. I am finding your blogs so encouraging!! This has been a hard couple days with unexplained allergic reactions, yet reading your posts has brightened my outlook and reminds me that God’s grace is always sufficient even on the toughest days. Thanks for sharing your journey! Welcome to the blog! I’m so sorry about the food allergies. My daughter has many of the same allergies as your daughter. It has been a long and challenging road to figure out all the allergies and to try to avoid them. However, it does get easier with time. And our daughter is doing so well now that we have been avoiding her allergens. I’m so glad that you have found some encouragement here. I hope you continue to find some answers for your daughter. Let me know if I can help in any way. I’m happy to share more about our food allergy and homeschool journey.